As we’ve covered the CTA’s efforts to get a transit TIF (tax-increment financing) district passed to help fund the Red and Purple Modernization project, some readers have commented that the $2.1 billion initiative would be a case of the city lavishing money on North Side transit while neglecting the South Side. Surely other Chicagoans feel the same way. But yesterday the CTA announced a new $75 million investment towards the $2.3 billion Red Line Extension on the South Side transit, which may help blunt those criticisms. The transit agency spent $425 million on the successful South Red Line reconstruction project in 2013, is currently working on the $280 million 95th Street station renovation, and has recently completed or started several other projects in historically underserved neighborhoods. 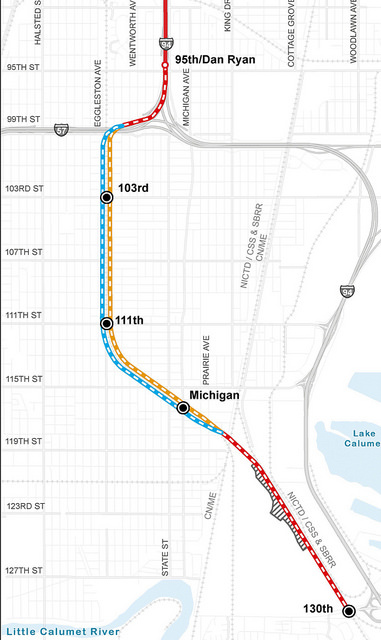 But South Siders have had a legitimate grievance that the long-awaited Red Line Extension project, which would continue the line from 95th to 130th Street, has crept along at a snail’s pace for many years. There was finally some significant movement on RLE in October. At that time the CTA released the draft environmental impact statement for the project in order to seek feedback from the public on the two potential routes being considered for the extension, either east or west of the Union Pacific Railroad tracks. The agency held a public hearing on November 1 and will continue receive feedback on the project until this Wednesday, November 30. Feedback received during this review period will be included in CTA’s analysis of the final proposed route. November 30 also happens to be the deadline for the CTA to submit an application for $1 billion in federal Core Capacity funding for the RPM project, which would pay for its first phase, in order to line up the money before the anti-transit Trump administration takes over. The transit TIF for the RPM project would be used to pay back a federal loan to cover the required local matching funds for the Core Capacity grant. Since the CTA is rushing to get aldermen to approve the new North Side TIF this week, perhaps it’s not coincidental that yesterday Mayor Emanuel and the CTA announced a new milestone in the Red Line Extension project. It’s possible that they hoped this news would help counter criticisms that they’re overly focused on improving North Side transit. Here’s the news on RLE. The CTA board has approved an amendment to its FY2016-FY2020 Capital Improvement Plan to include $75 million for preliminary engineering and analysis necessary to make the final determination on the route and to complete the final environmental impact statement. The engineering work is also required for CTA to apply for another $1 billion-plus in federal funds to help pay for the $2.3 billion project. The transit agency expects that procurement for further environmental planning and engineering work will happen in 2017. The $75 million amendment will be funded by CTA bonds. City Council will vote on the RPM TIF at a special meeting that takes place this Wednesday at 10 a.m. at City Hall. It came as no surprise, but it was still a relief, when officials announced today that the $1 billion federal grant for the CTA’s Red and Purple Modernization project has been approved. In honor of this milestone, here's a rundown of major infrastructure initiatives currently in progress or on deck.